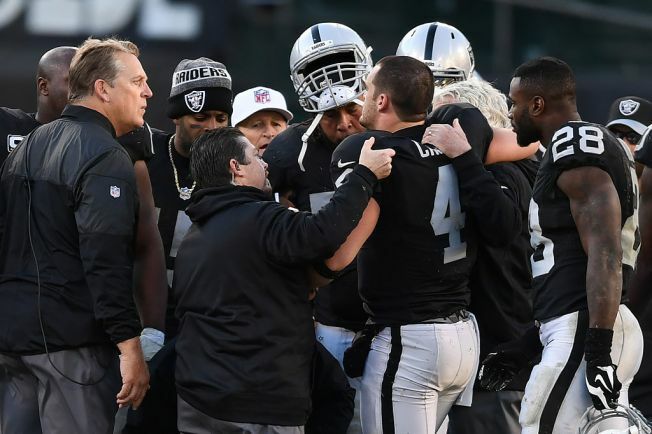 OAKLAND – Raiders quarterback Derek Carr exited early in the fourth quarter Saturday against the Colts with a broken right fibula. Head coach Jack Del Rio announced in his postgame press conference that Carr will undergo surgery on Sunday and is out indefinitely. Carr was sacked by Trent Cole and his right leg/ankle got twisted underneath his body. He immediately called for trainers and was in significant pain before being helped off the field by trainers. He wasn’t putting any weight on his right leg as he left the field. The Raiders sideline was in shock, with many players kneeling around him while being attended to on the field. Losing the Raiders quarterback for any stretch, especially this close to the postseason, is a severe blow to the Silver and Black. The Raiders improved to 12-3 with a 33-25 win over the Colts in Oakland, but did so while seeing their star quarterback go down. Carr threw for 228 yards and three touchdowns before exiting early in the fourth quarter. Rookie DeAndre Washington ran for 99 yards and two touchdowns in the win.